Paperback – fiction; Penguin Modern Classics; 246 pages; 2009. Review copy courtesy of the publisher. 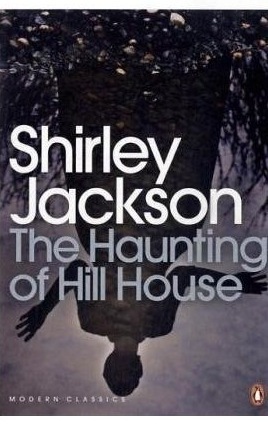 Reviewing two Shirley Jackson novels in the space of a week might border on overkill, but having very much enjoyed We Have Always Lived in the Castle I was anxious to try The Haunting of Hill House, which was originally published in 1959. First and foremost, unlike We Have Always Lived in the Castle, this is a horror story. Of course, the title itself should give you an inkling of the subject matter, which is essentially a rather creepy tale about a haunted house. Now this is where I put up my hand and declare that I’m not much into the horror genre. I read so many of these types of books (think Stephen King, Dean R. Koontz, James Herbert and Anne Rice) in my teens and early 20s that I eventually became bored with their formulaic style. And since then I can count on one hand the number of horror stories I’ve read (Elizabeth Kostova’s The Historian and Bram Stoker’s Dracula). There’s no doubt that The Haunting of Hill House is a creepy, look-under-the-bed-and-check-the-closet type reads. But in Jackson’s capable hands it also has a smattering of humour throughout, so it’s not overly claustrophobic and is far less spine-chilling than, say Stephen King’s The Shining, which this book brought to mind quite a few times. But Jackson ratchets up the suspense by playing with the minds of the characters, so you’re never entirely sure whether the terrifying events she depicts happen physically or psychologically. The book opens with a rather ominous description of the house. No live organism can continue for long to exist sanely under conditions of absolute reality; even larks and katydids are supposed, by some, to dream. Hill House, not sane, stood by itself against the hills, holding darkness within; it had stood so for eighty years and might stand for eighty more. Within, walls continued upright, bricks met neatly, floors were firm, and doors were sensibly shut; silence lay steadily against the wood and some of Hill House, and whatever walked there, walked alone. Into this secluded mansion come four main characters: Dr John Montague, a doctor of philosophy, who thinks himself something of a “ghost hunter” and has rented the house for three months in order to find scientific evidence of the supernatural; Eleanor Vance, a 32-year-old loner, who has spent the past 12 years looking after her (now dead) invalid mother; Theodora, a Girl Scout type with psychic abilities; and Luke Sanderson, a liar, thief and heir to the house. The house has two dour-faced caretakers, Mr and Mrs Dudley, who live in the closest town, six miles away. “In the night,” Mrs Dudley said, and smiled outright. “In the dark,” she said, and closed the door behind her. It doesn’t take long before creepy things begin to occur inside Hill House, but I’m not going to divulge them here. You’ll just have to read the book yourself. But make sure you do it in daylight. And preferably not while you’re alone. I just read this recently as well and thought it was excellent. I really like Shirley Jackson–there is always more to the story than what’s on the surface. I’ve heard the film adaptation (the original made in the 1960s) is very good, so I splurged and bought a copy (very cheap on Amazon), but I think I’ll save it for Halloween to watch. I’m going to read this on Hallowe’en! I’ll make sure to do so with the lights on. Oooo, you’re brave, Danielle, not sure I could watch the film. I can read horror/terror books, but I’m not so good at seeing them brought to life on screen. I’m glad to see this Shirley Jackson renaissance going on – and glad to see you enjoyed the books kimbofo. I’ve been a long time fan, and you’ve got me in the mood to pull out some of my copies and re-read. I’m not sure you’ve had a chance to check out My Life with Savages – but you might find it interesting to see the same writer going in a completely different direction. But I still love her creepy books the best! I saw the movie when I was about 10 years old and it terrified me. For weeks, I had my mother check under the bed and in the closets. When I was 15 I finally read the novel, it wasn’t quite as eerie as the film, but it still left an impression on me. I’ve been meaning to pick up a copy of the book and reread it and also watch the movie. I’m curious if it still packs a fright wallop thirty after the fact. Thanks for the Shirley Jackson reviews. I’m on the look out for them now! With the lights on… the doors locked… the curtains drawn… and the telephone nearby… just in case. Interesting… someone else mentioned My Life with Savages under my other Jackson review and said it was hilarious. Sadly, it looks like being out of print here, so looks like I’ll have to scour the internet for a secondhand copy if I’m to read it. Ummm, if you want me to watch the movie, you’re not selling it to me, Rebeca. Hahaha. I’m a HUGE wimp when it comes to horror films. I hate them. I’ll just stick to the books, thanks. Not sure if they’re available in Oz, but I hope you can hunt them out. She’s a terrific writer and I can understand why she’s so popular in her homeland. I think this is one book, and also clearly one author, that I need to get a move on with. This will mean me now having to run to a bookshop tomorrow, an invoice will be in the post Kim… tut, tut haha. Her books sound right up my street. Hehehe. I think you’ll enjoy them… they kind of fit in with your sensation season even if they were written in the mid-20th century! A genuinely scary book. Like you, I am not a great fan of horror being too easily freaked out. I think Sarah Waters was influenced by this novel. Her book, The Little Stranger, reminded me very strongly of The Haunting of Hill House.